We do a lot of talking about Catholic motherhood, but here’s an episode about Catholic fatherhood! 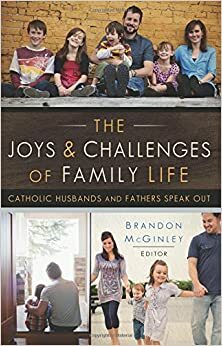 We got to chat with Brandon McGinley, editor of the new book The Joys and Challenges of Family Life: Catholic Husbands and Fathers Speak Out and Haley’s husband, Daniel Stewart who contributed a chapter to the book. We talk about everything from the difficulty men have finding community to being a spiritual leader in the home and NFP, so we cover a lot of ground! You can pre-order Brandon’s book and it will be released April 18th! The prayer after the Glory Be is “Oh my Jesus, forgive us our sins, save us from the fires of hell, lead all souls to heaven, especially those in most need of Thy mercy.” I believe it was taught to the Fatima children by the angel that appeared to them and was added to the Rosary based on his request. Just thought I would shed some light on that addition at least! I have been binge listening to your very fun, very much needed podcast. I live in Alaska in a very small community and desperately miss my Catholic friends . It has been so wonderful to hear you two laugh and chat about so many of the things I love to talk about . I kind of feel like your my friends. Thank you for that. Thank you so much Lisa! It’s so nice to hear that. We really appreciate you listening to the podcast and are so glad you enjoy it!